The Top Reason to Attend the 2016 Spring Cottage Life Show + FREE Ticket Opportunity! It’s that time of year again; Spring has begun to show itself slowly and with the changing seasons Summerwood gears up for cottage season! As Canadians we know to embrace whatever good weather might come our way and to enjoy every possible second that we can in the great outdoors. Read on to learn about the top reason you should attend the 2016 Spring Cottage Life Show, where we’ll be featuring our incredibly popular Glen Echo “Permit-Free” Ultimate Cottage Bunkie, and how you can get your hands on free tickets to the Spring Cottage Life Show. If you’ve previously attended the Spring Cottage Life Show you might know a little about the amazing little 3-day show that exhibitors and consumers both love for its fun, laid-back “cottage” atmosphere and great mix of eclectic exhibitors. The Main Stage, Model Cottage, and Dock Party (yes, really!) are a few of the neat features that visitors enjoy every year at this show and part of the reason many families make attending this Show an annual tradition. The 2016 Cottage Show is being held at the International Centre at 6900 Airport Rd in Mississauga and features free parking for all visitors (more parking has been added for the 2016 show). All of the information you need, including ticketing information and directions, can be found here. Our show-stopping Glen Echo “Permit-Free” Bunkie, featuring expansive “bigger than you think” loft space and oodles of natural light. You may have seen our Glen Echo design at a previous Cottage Show where we always have one of the busiest and most active booth spaces at the show. 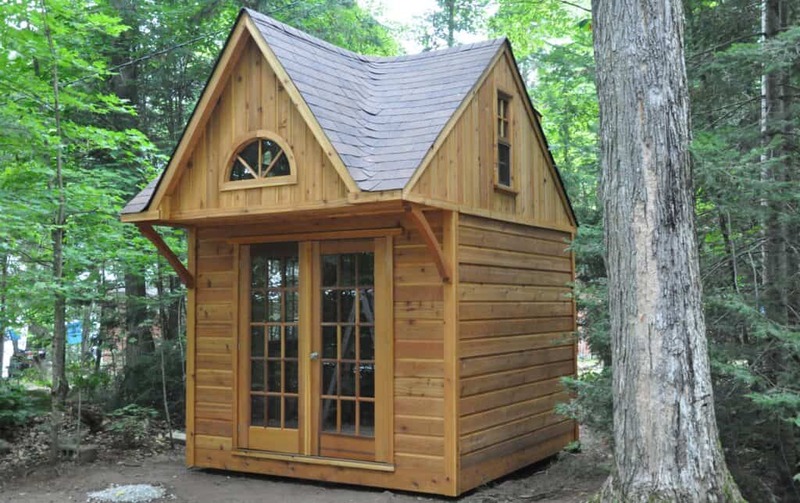 As a company we love showcasing this incredibly cool product and conversing with our fellow cottage-goers and explaining how this building, or perhaps one of our other prefab cabin designs, is the perfect solution to your cottage storage or sleeping overflow problem. Come join the crowd! Our booth is a real highlight of the Spring Cottage Life Show. This year you’ll find us at Booth # 932 in Hall 2. Why would I want a “permit-free” cottage Bunkie? 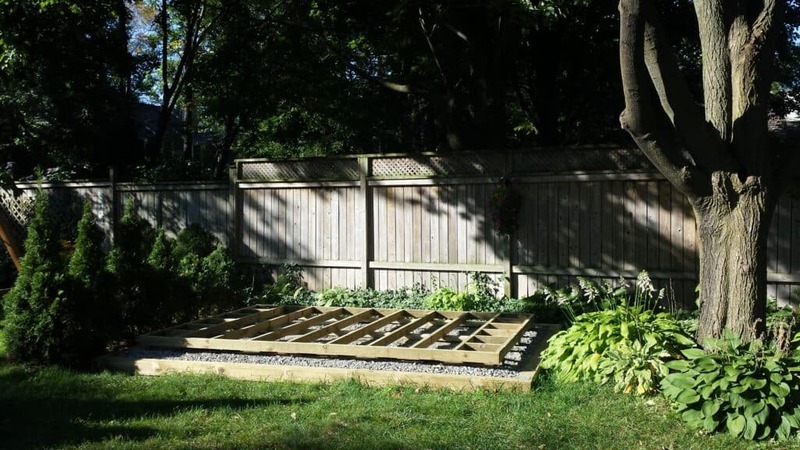 The Glen Echo bunkie, built from a DIY kit by our client in Ontario, Canada. It’s the perfect tiny house! The Glen Echo is designed in a 10′ x 10′ size to clock in at 100 square feet and as a result of its small footprint is typically classified as an “accessory storage structure” under many municipal bylaws, which generally means a building permit application isn’t required when building this unit. The building features a steep roof pitch and “dormers” to open up the ceiling space and create headroom in the loft. The 3′ of roof overhang on the front side of the building, typically not counted as square footage by building departments, adds close to 130 square feet of usable loft space. To learn more please download the building schematics now to learn all about this exciting design and its very handy features. Are you a more visual person? Take a 3D tour now! Add a mattress or extra large sleeping bag to create the ultimate loft space that kids and adults love! You’ll find the Summerwood booth located at Booth #932 in Hall 2 of the International Centre. We’ll have a gorgeous Glen Echo Cottage Bunkie on display where you can take in the space for yourself, ask us questions, and learn about the endless customization possibilities with all Summerwood buildings. We love hearing from our customers – past, present, and future – so please be sure to say hello! Check out our Bunkie and climb the super cool drop-down ladder. Kids love it! Looking for free tickets to the 2016 Spring Cottage Life Show? We have a limited quantity of complimentary tickets held exclusively for VIP Summerwood customers, please Contact Us for more details and availability.